Following the successful tests with the metal-burning ramjets, in 1937 the "Osoiaviakhim Central Council Stratospheric Committee Jet Section," GIRD's parent body, issued a plan to test a metallic-fuelled ramjet missile. This was approved by top Soviet aeronautical scientists, and a special design section, headed by aeronautical engineer Yuri Shcherbakov, was established to design the test vehicles. Two types of [propellant] grains were used in the rockets. The type manufactured by V. A. Abramov, a chemist from the Moscow State University, consisted of aluminum and magnesium powders bonded with an organic filler. These grains were very stable and burned uniformly in the engine chamber. The heat-producing capability of the grain equaled 4200 kg-cal/kg.... Grains of another type were manufactured at the D. I. Mendeleyev Chemical-Engineering Institute. The grains were made by compressing aluminum and magnesium powders under high pressure. To intensify the burning process and increase the engine thrust some oxidizer (potassium chlorate) was added to those grains. Three series of ramjet rockets (16 in all) were manufactured for testing in flight. The ramjet rocket of the first series had the following specifications: the first stage weighed 3.8 kg and the powder it contained weighed 1.4 kg, its total impulse was 260 kg/sec, maximum thrust was 118 kg and powder burning time was 2.24 sec; the ramjet rocket (second stage) weighed 4.5 kg and its diameter was 121 mm; and total initial weight of the two-stage rocket was 8.3 kg. Several of the projectiles were used up in wind tunnel tests during 1938, and in February, 1939, the first flight tests were conducted near the Planernaya Station, outside Moscow. The first fully successful flight occurred on March 5, 1939. 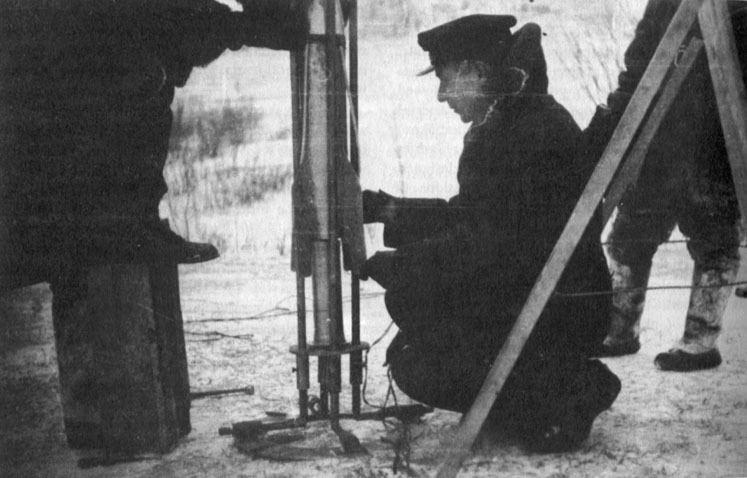 When the experimenters decided that the rockets were functioning as intended, an official test was planned, during which the acceleration of the rocket would be carefully tracked in order to calculate the exact thrust of the magnesium/aluminum ramjet. Lacking electronic tracking means, the experimenters decided to the launch the missiles at night and use the incandescent exhaust of the metallic ramjet as a tracking beacon. The plotting of the missiles was based on meteorite observation techniques. To determine precisely the flight velocities and rocket altitudes, a group of astronomers was invited; they used the methods of meteorite observations for this purpose. Official tests of the ramjet rocket, which took place on 19 May 1939, were performed at night to permit the rocket motion to be followed against the background of the dark sky by watching the trace of exhaust gases. The grain used in the rocket was made at the D. I. Mendeleyev Chemical-Engineering Institute. After the powder was ignited the rocket left the launching device and went upward. The first stage having separated, the second stage of the ramjet rocket climbed with increasing velocity. Those present at the tests could see distinctly that the rocket flight was successful.